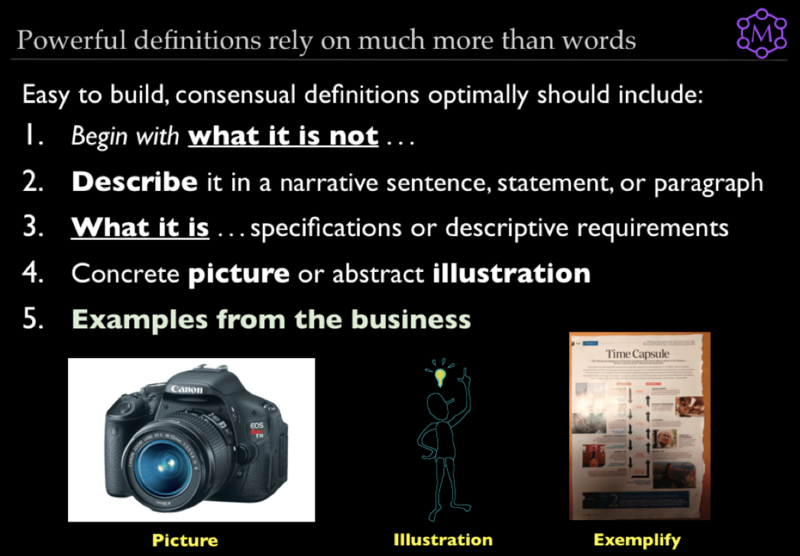 To build an operational and consensual definition that your group can live with, in their own words, and with their understanding, use the following method. Since narrative descriptions alone may fall short of the entire meaning, we also want to support the consensual definition with illustration and examples. Use this robust method for consensual definitions of terms, phrases, or expressions with a group of meeting or workshop participants. Keep in mind that the standards expected below are demanding. They include five effective activities. Keep this tool in your hip pocket and use it whenever you encounter serious discord over the meaning of something. You may also need this tool when you manage open issues (ie, Parking Lot) and your participants do not agree or cannot remember what something meant. Additionally, the analysis activity of brainstorming begins when the ideation energy begins to wane. An indicator that it may be time to transition to analysis could be a question raised about what a term means, or someone raising an argumentative point that something can or cannot satisfy a specified condition or requirement. Session leaders are faced with groups and participants (who may be in violent agreement with each other) who need to develop consensual understanding about what a particular term, phrase, or expression means. The most underutilized tool in the sphere of facilitation is a robust definition tool. Therefore the first step frequently required to support effective analysis requires properly defining something. To build a consensual definition of a term or phrase that the group can live with, in its own words, and with its own understanding. Since narrative descriptions alone may fall short, support your consensual definition with an illustration and examples. This MG RUSH tool supports consensual understanding around terms and phrases. Use something more robust to develop rich definitions for complex ideas like processes. Hence, for an entire workshop(s) Activity Flows may be more useful. First identify “WHAT THE TERM OR PHRASE IS NOT”. Next, compile a narrative sentence or paragraph that generally describes it. Compare later to a dictionary or other professional definitions and support. Then list the detailed bullets that capture the specific characteristics or specifications of the term or phrase as intended by the participants. For example, with a camera, we might detail requirements for the quantity of mega pixels, zoom range, etc. Obtain or build a picture of concrete items or create an illustration of the item if it is abstract or dynamic (eg, process flow). Provide at least two actual, real-life examples from the participants’ experience that vivify the term or phrase. For example, a utility bill can be defined, but it is helpful to show an actual invoice (eg, electricity for the period 15JAN20xx to 14FEB20xx).